It always sneaks up too fast. Dark creeps in earlier each evening; the woods go silent; swallows gather on the power lines, then vanish. I was happy to fit in a final weekend at the ocean, where it was still plenty warm for one last swim. A row of kites fluttered overhead. Yellow primroses bloomed at the edge of the dunes. But flocks of sandpipers chasing the waves amidst late-season beach-goers were a sure tell of the season’s turning, as were the multitude of bright orange-red rose hips ripening in the sun. Summer’s end is here. Tips and Techniques: When heading out to sketch, it’s helpful to think about what you can accomplish in the time you have. If you have 10 minutes, pick a 10-minute subject. This helps keep frustration in check, and you’ll avoid starting something you can’t finish or can’t capture sufficiently in the time you have. I’m fairly quick with drawing, but quite slow as a painter. 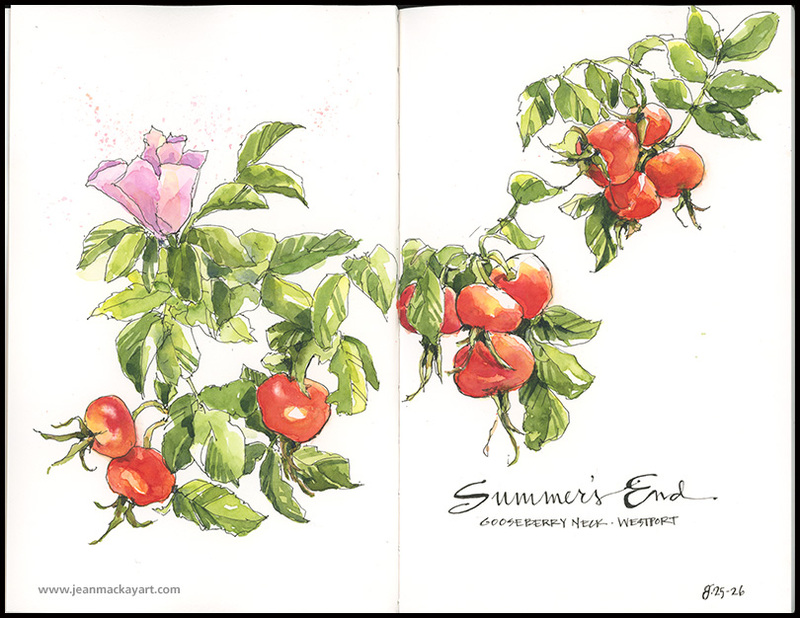 I often choose subjects I can begin in the field and finish at later home, as was the case with the rose hips. Subjects like birds and trees take me longer to render well, so I don’t tackle them unless I have at least an hour. The more you work in the field the better you’ll become at picking subjects you can tackle well within the time you have.